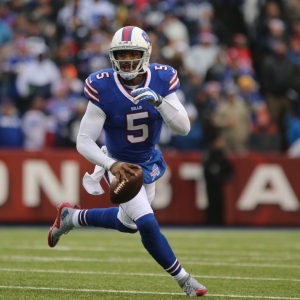 Buffalo: I think the Bills could actually do a whole lot worse than Tyrod Taylor, but they obviously don't agree. But by starting Nathan Peterman last week when all was not lost in the playoff hunt the Bills made it clear that they don't view Taylor as the long-term solution. And by throwing five interceptions in a half Peterman made it tough for the team to have long-term faith in him. The Bills have taken some positive steps forward, and the future is fairly bright, but they have to figure out what their future holds under center if they want to achieve their full potential. Moving on from Taylor is likely to be a risky move because he's going to get a chance somewhere else, and he could come back and haunt the Bills. Miami: Going with Jay Cutler once was a bad idea with limited upside even in the best of circumstances. Going with him a second year would be indefensibly stupid. They won't do that, and they have burned their backup options, so they are going to face a total overhaul this year. With the Bills in decent shape and the Jets not as bad as people thought, it is important for the Dolphins to keep up in the arms race for second place in the AFC East. And New England can't stay strong forever. Can they? New York Jets: Speaking of the Jets, they have been decent enough this year that we could believe that their rebuild could be less painful than seemed likely. But they have to figure out their QB situation because they haven't had a good answer back there for far, far too long, and they don't have one amongst their multiple options right now, either. It's time to start from scratch and figure out a new way. New York Giants: Peyton Manning was really good until he wasn't. Then he was bad - even though he won a last Super Bowl. Eli Manning was very good until now when he really isn't. It seems to be a pattern for the Mannings, and I don't have a lot of faith that Eli can prove that that isn't the case. At the very least the Giants need to figure out who their next guy is going to be so he can be a backup next year - and it's not going to be Geno Smith or Davis Webb. They are likely to have a new coach next year, and the new guy isn't going to be keen to be handicapped by having to deal with Manning at a fraction of his full capabilities and no other option. Cleveland: Stop me if you have heard this before - the Cleveland Browns need to get their act together under center. I don't know what is more staggeringly ridiculous - the incredible string of failed attempts to find a starter since Tim Couch, or the number of established and strong starters that were sitting on the board when they picked and they passed on. Either way, the Browns are shopping, and it sure seems like a good bet that they will mess it up and be right back in this same spot again next year. And the year after. And 10 years from now. And when my great-grandkids turn 70. Arizona: Carson Palmer has had a great run, but he's about to turn 38, his body is breaking down badly, and the Cardinals are on a fast train to nowhere. Surely he's about done - if not as a player then at least as a viable starter in the desert. This team was doing so well just a couple of years ago, but now they are treading water and really need to reload and regroup to become relevant again. That means finding a new QB, and what we have seen since Palmer was hurt makes it very clear that they don't have one now. Green Bay: Unlike the others on this list, the Packers don't need a starter. But they are in desperate need of a backup. With all due respect to the Vikings, the Packers should be winning this division handily. But as soon as Aaron Rodgers went down, the season ended instantly. It's not that the team faltered when a superstar QB went down that is the issue. That's almost a given. It's that the team insisted that Brett Hundley was a viable starter, and they wouldn't waver from that belief. I know that college form doesn't always translate to the pros, but I have watched enough Pac-12 ball over the years to know that Hundley was not a big-time starter consistently at UCLA, and that his instincts were far from profound, so to trust a team with a championship window wide open to a guy like him was just reckless. They need to fix it - they have no option but to do so. Sometimes, the best picks are free picks. Doc's Sports will give new clients $60 worth of free NFL picks with absolutely no obligation. You don't even need a credit card to sign up. Just click here and get started today . Also, get three handicappers for the price of one when you sign up for a full-season football package! Click Here for details . Get free NFL betting picks weekly on Doc's Sports free football picks page .